Weavers take almost 15 days to complete elaborately hand-woven saree with intricate art works. Chennai: Thirubuvanam silk saris produced by the Thirubuanam Silk Handloom Weavers Co-operative (Thico) Production and Sales Society Ltd. have been given geographical indication (GI) tag by the Registry of GI according to P. Sanjai Gandhi, President of the Intellectual Property Attorney Association and advocate of Madras High court. Sanjai Gandhi, who along with Union ministry of Textiles took efforts to get the GI tag following application from the society in 2013, told presspersons at Thanjavur on Tuesday that the registrar Mr. Gupta and deputy registrar Chinnaraju Naidu gave the certificate to him on Monday. “I will hand over this certificate to weavers of the society on Wednesday at Thirubuvanam,” he said. Like most other commercial silk sarees, Thirubuvanam silks sarees are also made from domesticated ‘Genus Bombyx’ silkworm. The finest quality raw silk and the highest fibre production come from this silkworm, which mainly feeds on the leaves of mulberry tree. Thirubuvanam silk sarees are crafted in handlooms, as against power-operated or automated looms. Weavers make a number of design motifs and various art works in the sarees. The aesthetic silk saree, weighs around 450-1250 gm. The silk alone weighs around 400 gm and the rest of the weight comprise zari. Traditionally these silk sarees would measure about 12ft in length and 4ft in breadth. Weavers take almost 15 days to complete elaborately hand-woven saree with intricate art works. The sarees have excellent draping qualities and have natural resistance against creasing and wrinkling. Sanjay Gandhi, counsel for the petitioner, said on behalf of the society, the department Of handlooms and textiles Government of Tamil Nadu, has filed the petition. It provides employment to about 2,000 families. The society presently has 37 sales outlets spread throughout Tamil Nadu, and two in Puducherry. 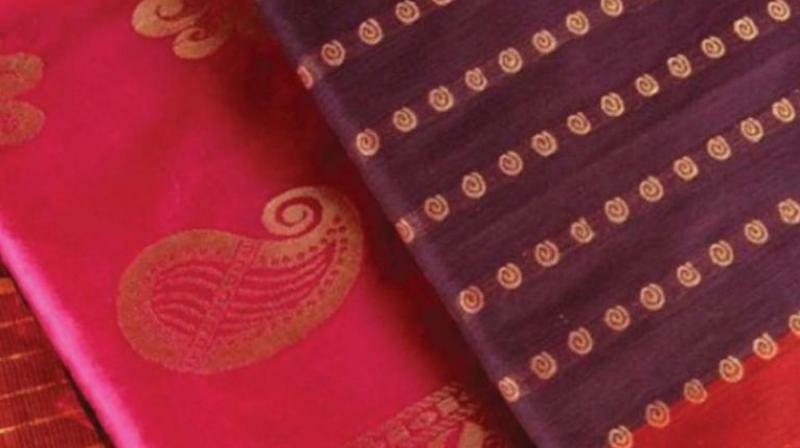 The Thirubuvanam variety of silk sari has its own unique features. It is very smooth and it spreads over the body of the wearer elegantly. The pallu is woven continuously on the loom and the pallu simply runs on from the body of the saree, he said, The society uses best skilled yarn and pure zari. The society caters to both contemporary and traditional taste, and is a hub for sarees, especially during the bridal seasons, he added.